hometown focuses on the locations where our personal urban life takes place and what is special about them. 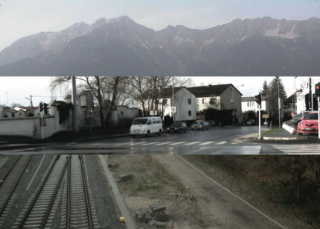 the starting material consists of recordings of urban situations/spaces in innsbruck, linz and berlin. hometown is divided into four movements and a prologue. prologue we see this as an introduction to our piece for the listener – a chance to get to know the sound material and our sound vocabulary. 1st movement – spaces the sound sphere of three urban back courtyards, courtyards of city apartment houses, here becomes a cantus firmus. our interest in terms of composition lies in the communicative quality of these acoustic spaces. 2nd movement – colors starting material is recordings of the sound condensations in the urban sound sphere, sounds of the major urban traffic arteries with all of their acoustic phenomena, called forth and distinguished by their architectonic situations … these are burning and friction sounds, … modulation, layering, mixing … drone. 3rd movement – rhythm rhythms and rhythmical structures that can be experienced every day in public space. the compositional undertaking is nourished by rhythmic patterns of our city life and the polymetry that underlies them. 4th movement – space the sound material from a concrete urban situation (berlin, border between prenzlauer berg /wedding) becomes the cantus firmus. all musical and sound aspects of the three previous movements merge here.